Give the gift of beautiful skin this holiday season! 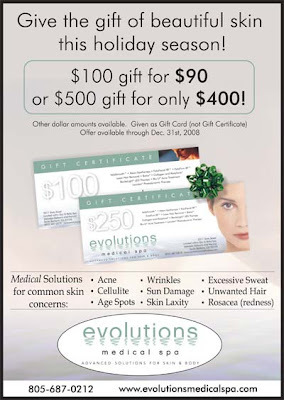 Santa Barbara’s Evolutions Medical Spa is offering special discounts on gift certificates until December 31st, 2009. A gift certificate to Evolutions is a great way to introduce a friend or family member to Evolutions many medical or aesthetic treatments. Gift certificates can be applied toward luxurious facials, dermal fillers like Restylane, Juvederm, and Radiesse, Botox or Dysport treatments, laser facials, FotoFacials, Evolutions signature Total Tightening treatment, chemical peels, VelaShape body contouring, laser hair removal, all of our medical grade home care products and more! Complete list of services available on our website. Visit Evolutions Medical Spa in dowtown Santa Barbara to purchase your gift certificate.